PRIME CINEMATOGRAPHY CONSULTING started with a group of talented cinematography individuals using new technology in their day to day production work. With our love for the Art of Cinematography and passion for sharing with fellow enthusiasts has grown into a diverse training portfolio. The Prime family of learning opportunities include all areas of cinematography including aerial, lighting, interviewing, gimbal, editing, Part 107 licensing and more. We believe in learning from doing (hands-on experiences built-in) and diving deeper than mere techniques into what and how images communicate with your audience. Flying with Cameras" workshop belongs to a family of workshops, university film school presentations, and one-on-one training nestled under Prime Cinematography Consulting.Watch for upcoming workshops on "Moving with Cameras"--learning the art of camera movement, and tools like Gimbal and sliders--and more in the Prime family of workshops. "FLYING WITH CAMERAS" and its family of workshops (Moving with Cameras, Sliding with Cameras, etc.) dedicated to camera movement were born of a passion to promote the art of cinematography through education and hands-on experiences. 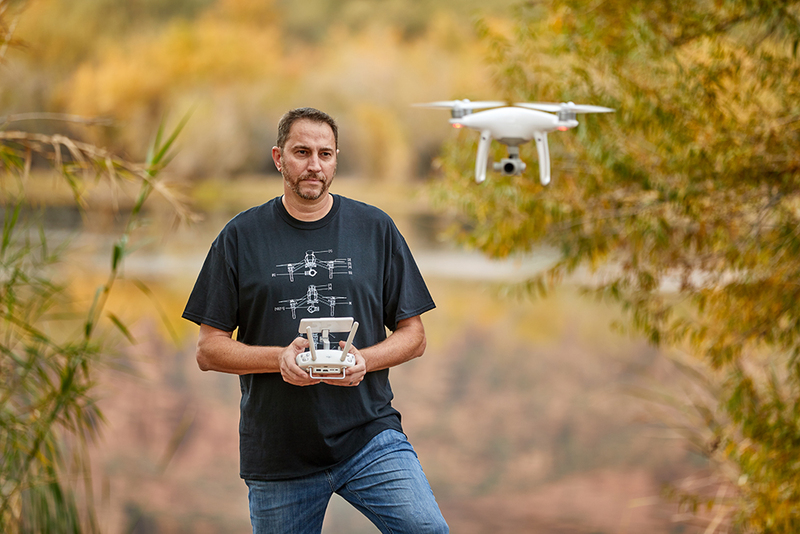 THE BEGINNINGS: As Christophe Tinard and DJI Arizona partnered in this vision, they developed curriculum, a workshop concept, and then spent a year testing and fine-tuning the experience. The outcome is proven material that really changes your relationship with your filming gear and shows how to get the most out of what you capture. Whether its foundational knowledge you seek, or building blocks for professional level shots, this series of workshops were custom built to see a huge impact in your skill level quickly. A BIT ABOUT YOUR PRESENTER: Christophe Tinard, is a Paris-native who has had two passions: basketball and videography. Playing for the Junior National Team in France at a young age, Chris eventually moved to the U.S. as a foreign exchange student, and moved on to play basketball at Montana State. After college, he returned to France to play professionally for a season. An American girl he met one summer was enough to have him pack-up and move-out to Phoenix, Arizona; where he calls home. He and his wife (American girl) have four children and live in North Central Phoenix. When he retired his basketball jersey, his passion for videography took flight. Christophe has spent many years in the Valley mastering his craft of videography, editing, and storytelling for well over a decade. He is Head of Production and Managing Partner at Hire Story and travels the country filming high-level businesses for recruitment and training purposes. Christophe has also built a broad depth of freelance work including documentaries, interviews, live news, and currently, a music video. His body of work was recognized with a Rocky Mountain Emmy nomination in 2017. Christophe's greatest love is mastering his craft in order to produce beauty from every shot, and bring emotion to the viewer with everything he captures. Another great love is passing on his knowledge to those around him. A teacher by nature, he enjoys being with people and imparting whatever he has learned along his journey of cinematography. GOT QUESTIONS? We'd love for you to Contact Us.